Addie Motzko, a Minnesota native, has resided in Minnesota most of her life, other than two years spent in Portland, Oregon. 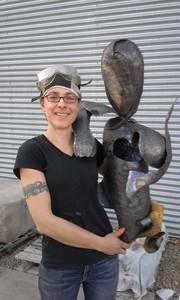 She is an artist in all media, specializing in abstract painting and metal sculpture. Addie's work is influenced by organic shapes found in the natural world that translate themselves into subconcious and abstract forms. She is interested in the contrast between the natural and the man made world. For example, how organic shapes that represent nature an be pounded from pieces of flat steel and welded together to create abstract and organic forms. The steel is a canvas that presents emotions, ideas, thoughts, and experiences that translate themselves into a three dimensional work of art. Addie's work can also be figurative and inspired by real people as well as human qualities that influence and motivate her. Addie's work has been exhibited at One Division Art Gallery, The Gallery at Zeller Studio, the Plymouth Primavera, the Solar Arts Building at the annual Art-a-Whirl event, Hutchinson Sculpture Stroll, Minnetonka Center for the Arts, Minnesota Landscape Arboretum, Guild of Metalsmiths and at the University of Minnesota, Morris. Addie has experience teaching art as the Welding CoInstructor and Studio Monitor at the Minnetonka Center for the Arts, student teaching Visual Art ad Art History at Willmar High School and Minnewaska High School as well as the Art Coordinator at Port City Development Center teaching art to adults with developmental disabilities.